We have a very unique and special June 2015 offering for our Workbench of the Month feature. 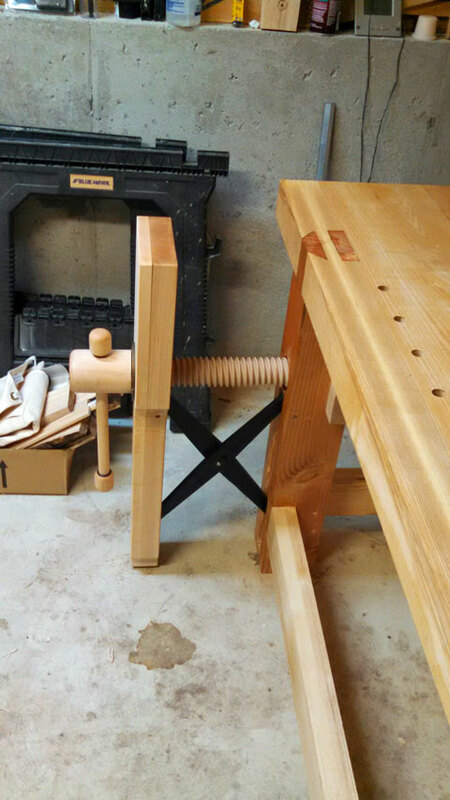 This amazing table (yep, no workbench this time) comes to us from Chuck H. from Chagrin Falls, Ohio. 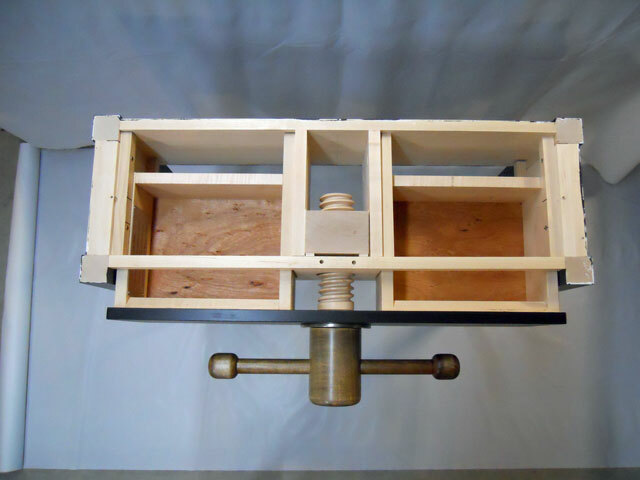 The details on this special feature are listed below, but it just goes to show that a wooden vise screw can be used for great mechanical and artistic wonders outside of the workbench zone. We think you are all going to like and very much appreciate this special feature, Enjoy. My daughter and her husband have a metal table with a table top that can be raised and lowered with a rack and pinion gear set up (picture is enclosed). 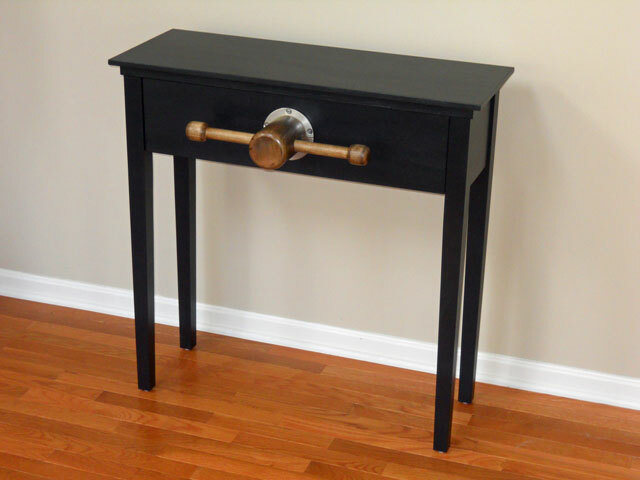 She wanted a console table for the room that would match the theme and period of the rack and pinion table. 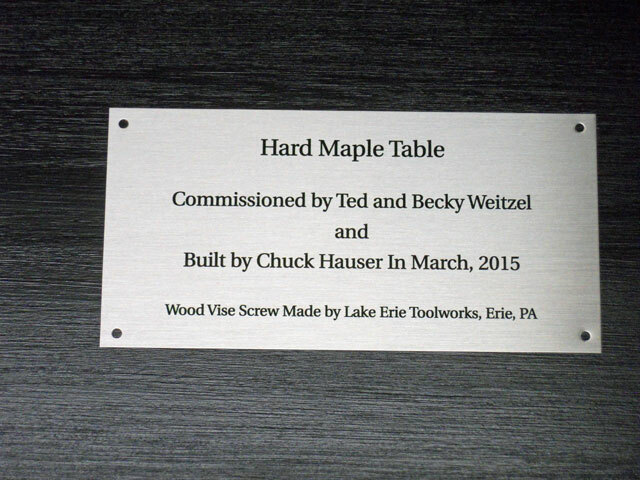 Accordingly, I made them a hard maple console table that incorporates a Lake Erie Screw Vise that operates (opens and closes) the two drawers. The table is made from solid hard maple except for the 1⁄4” plywood used for the drawer bottoms. It measures 34” high, 34” wide and 13” deep. 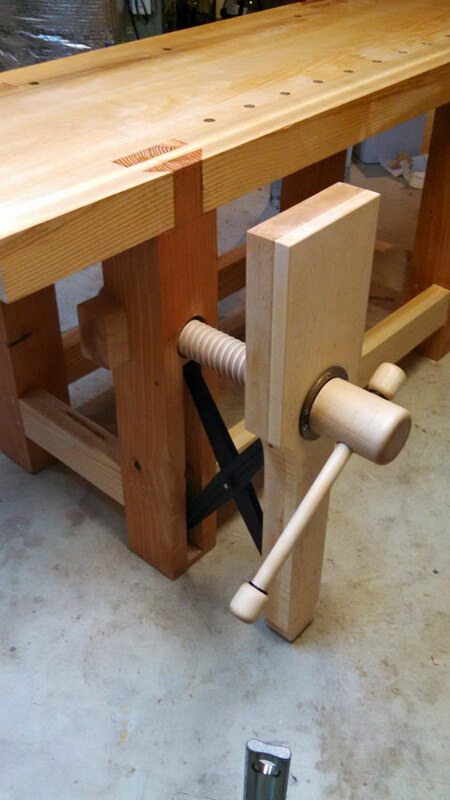 The screw vise hub and handle are stained with two coats of Jacobean stain and four coats of satin urethane to match the handle on the rack and pinion table. 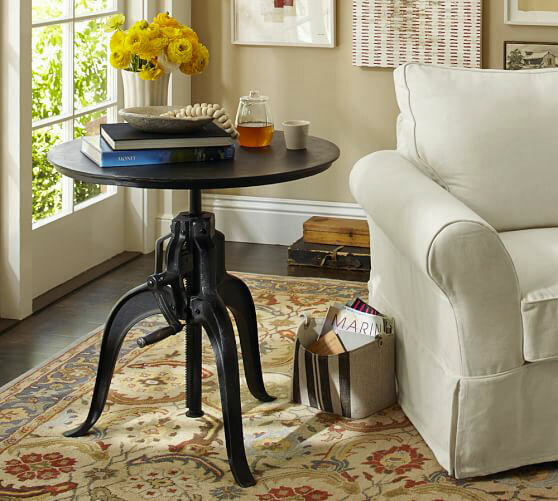 The external brass garter and screws were nickel plated in order to match the other décor in the room. The table top, side and back aprons and the legs are painted with a black satin enamel paint. 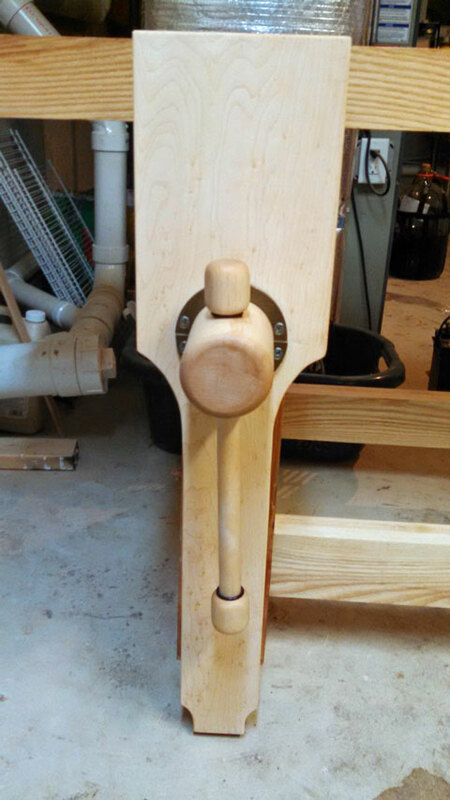 The aprons are joined to the legs with dowel joinery. 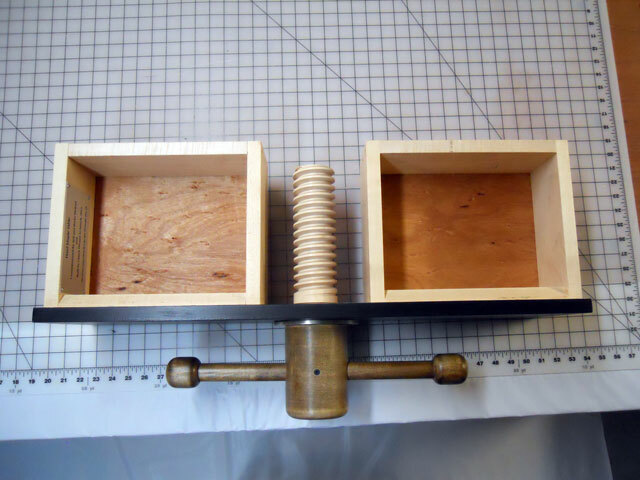 Two drawers are attached to a single drawer front and the garter and screw are attached to the center of the drawer front. 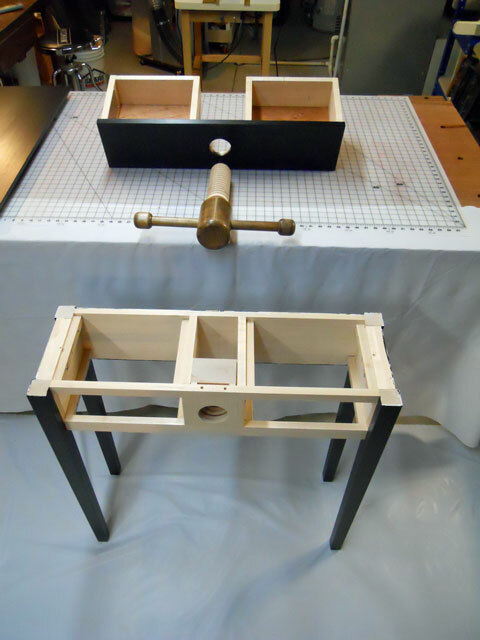 The screw vise nut is built into the front table dividers and the partitions. 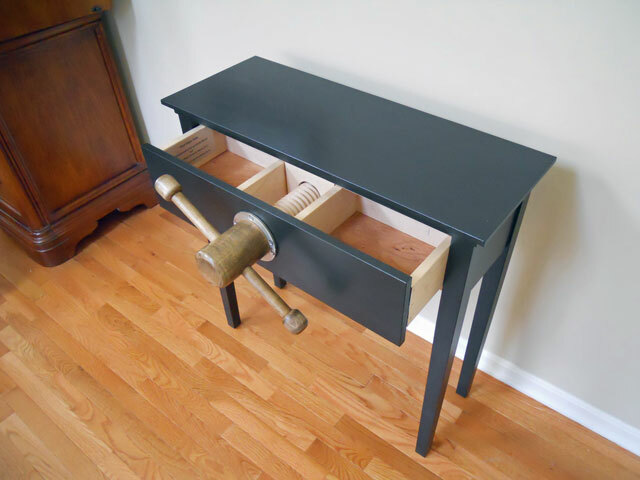 Blocks are attached to the bottom of the drawers that allow the drawers to open fully but prevent the drawers from coming out of the table. Nick of Lake Erie Toolworks was extremely helpful in answering questions when I was in the planning phase of the table. I really love the product that they make. 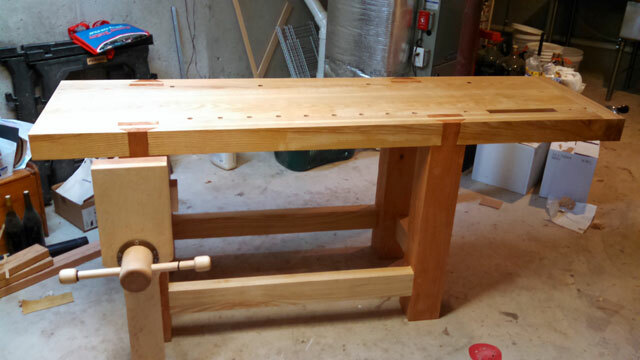 Our May 2015 Workbench of the Month comes to us from Marcus S. from Methuen, Massachusetts. He has built one of the finest Roubo workbenches that we’ve ever seen and we think you’ll find the craftsmanship evident in this New England beauty. Fantastic job Marcus! I feel compelled to share my completed workbench with you folks in no small way because of the superior quality screw vise that I purchased from you over two years ago. I started this bench prior to the birth of my second son and it was my first woodworking project of any substance. Even before purchasing the lumber I purchased the large screw vise from you folks. At the time I believe that it was the only vise screw that was being offered. I started by sourcing two 16/4 ash slabs, 8ft long by about 10inches wide. Edge joined and then dressed flat with hand tools, this bench top lived a fairly quiet and unbothered life up on sawhorses in my basement workshop for two years. Eventually I added some width to it with more ash to accommodate a wagon vise. In between changing diapers, applying bandages (you know how boys are) and work I managed to source a fir tiber for the legs and cut those foolish dovetail / mortises that Roubo cursed upon us in his Plate 11. Despite the labor intensive quality of doing this with hand tools, the results are spectacular and if those legs ever come lose in my lifetime I’ll be surprised. Then this last December I got the itch and managed to complete the bench. The stretchers for the legs are ash as well. The stretchers are joined to the legs with drawbore tenons. The vise chop is 8/4 hard maple laminated to a spare piece of 4/4 birdseye hard maple and it grips like all get out. Now that the never-ending bench project is complete, my wife has started requesting projects. I’ve been happy to oblige knowing that the leg vise grips like a bulldog. It has been an absolute pleasure to use. I want to thank you for the superior product. I’ve enclosed a few photos of the bench in case you’re curious. Thanks again.